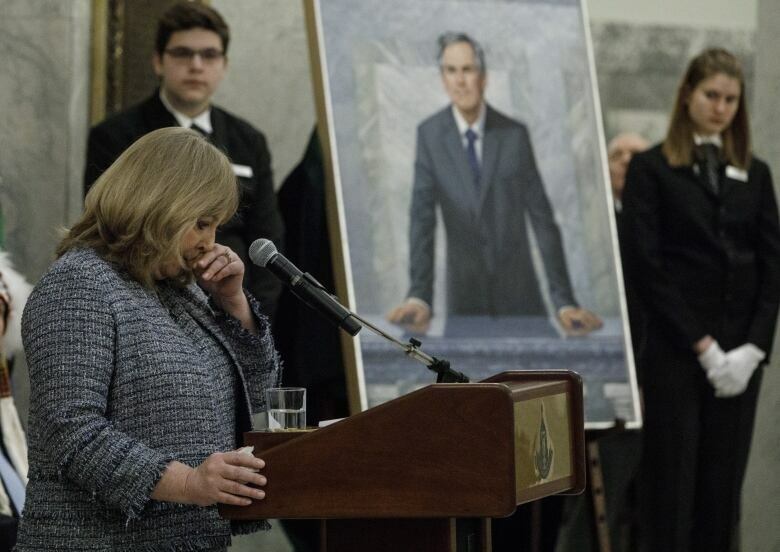 The official portrait of Jim Prentice, unveiled Monday, shows the late premier standing on the third floor of the Alberta legislature, hands resting on the marble railing, with his eyes looking off in the distance. 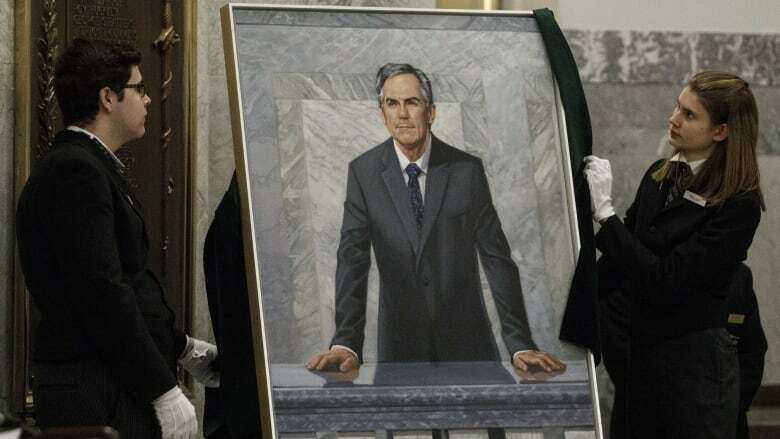 The official portrait of Jim Prentice, unveiled Monday, shows the late premier standing on the third floor of the Alberta legislature, hands resting on the marble railing, eyes looking off in the distance. "The expression and gaze shows Jim's sense of vision," Karen Prentice said in a speech during the unveiling ceremony at the legislature. "He's thinking of the future and not the past." The portrait was painted by David Goatley, a B.C.-based portrait artist, who also painted former Canadian prime minister Kim Campbell. Prentice said her husband chose Goatley to paint his portrait. The work was undertaken after Prentice's death at the age of 60 in an October 2016 airplane crash near Kelowna, B.C. Prentice served as premier from September 2014 until May 2015, when his Progressive Conservatives were defeated by the NDP. Karen Prentice's speech was heartfelt and frequently punctuated by tears. She broke down briefly as she introduced her third grandchild. The little boy, born at the end of December, was named after her late husband. The baby was quiet throughout the ceremony while cradled in the arms of his mother and the couple's daughter, Cassia Prentice. "He only opened his eyes when we unveiled the portrait," Karen Prentice told the crowd with a laugh. "Took a look and I think he likes it." In addition to members of the Prentice family, the unveiling ceremony was attended by Alexis Chief Tony Alexis, Premier Rachel Notley, United Conservative Party Leader Jason Kenney, who served with Prentice in the federal cabinet, and Alberta Party Leader Stephen Mandel, who was minister of health during Prentice's time as premier. Former premier Dave Hancock, former deputy premier Doug Horner and former and current MLAs were in the audience. Notley paid tribute to Prentice's devotion to reconciliation with Indigenous people and his efforts to end child poverty. Notley recounted a conversation she had with Prentice shortly after the May 2015 election. He urged her to keep working on the settlement with the Lubicon Lake Band, a process he had reopened the previous fall. The band had been seeking an agreement for 80 years.
" 'We're close,' " Notley recalled him saying. " 'I think it's possible to get this done.' "
"He saw a path forward and he advised me how to travel that path, for which I, and many, many others, are very grateful." Notley said people acknowledged Prentice's important role when the deal was finally signed late last year. Prentice was the Conservative MP for Calgary Centre-North from 2004 to 2010 and served as industry minister, environment minister and minister of Indian affairs and northern development under former prime minister Stephen Harper. After he left federal politics, Prentice was vice-chair and senior executive vice-president with CIBC from 2010 to 2014.